Note: This event has now taken place. Please contact info@iformulate.biz if you are interested in accessing course materials or future training on this topic. Help you understand your formulation better – and help you design next generation products more effectively. 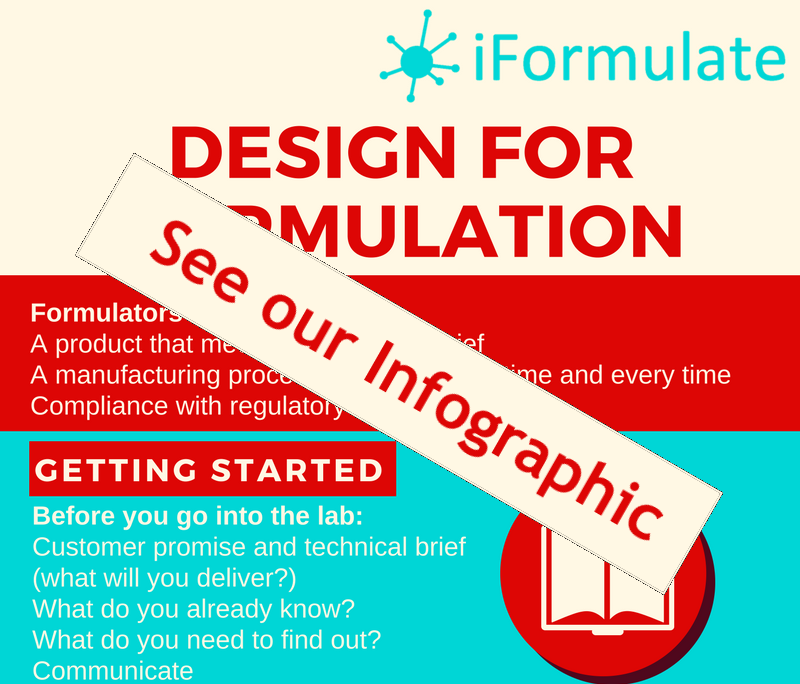 To help you with design for formulation, we’ve put together this training workshop. Others involved in the new product development process (e.g. purchasing, marketing) who may become involved in product or process design for formulated products. Ensuring your product and process are future-proof, i.e. capable of being adapted to meet future requirements. You can also take a look at the recording of our short webinar from 2015 in which Ian Jolliffe introduces “Design for Formulation“. What are the objectives and benefits of formulation design? Development strategy – what, how and why? Practical applications of DoE for multi-factor processes. 3. Use of DoE to perform early scale up study and verify the robustness of the process ready for transferring to pilot plant. Awareness of the potential pitfalls in scale-up can help you design an effective pilot programme, to mitigate the risk of expensive delays and failures when moving from lab to manufacturing scale. The session will be illustrating by examples from industrial practice when things didn’t go quite to plan. Today, all organisations are using lean, six sigma, operational excellence or some other form of continuous improvement (CI) methodology. David Hood – an renowned authority on CI – working for The Excellence Partnership Ltd, will help develop our knowledge of what’s required to make our NPD process effective. Design for Formulation will be held at the Jury’s Inn Hotel, East Midlands Airport, UK. The location is convenient for road (M1), mainline rail (East Midlands Parkway) and air (European and UK) connections. Further details on the venue and travel connections can be found here. Attendees will receive copies of all workshop materials on a USB memory stick. Lunch and refreshments will be provided for attendees but accommodation and other meals are not included. Terms and conditions can be found here. If you have any further queries you please e-mail us at info@iformulate.biz.